It’s been a hectic Christmas schedule which has seen the Chairboys extend their unbeaten run to seven league games. However, three consecutive draws caused some pundits and fans to claim that the bubble had burst at Adams Park, a viewpoint I disagreed with. A point at the Crown Ground, where Accrington Stanley had won six of the last eight games was not to be sneezed at in tough conditions. Whether at the top or the bottom of the league, it’s always vital to avoid defeat against the teams around you and Gareth Ainsworth has done just that over the hectic Christmas period. His small squad was stretched to breaking point but still picked up draws against Luton at home and then again just two days later at Shrewsbury. It’s equally important to dispatch the teams at the bottom of the table too and Hartlepool United rolled into town with two additions to their rock bottom squad. Striker Rakish Bingham, who earlier in the season gave the Wycombe back four an awkward fifteen minutes turning out for his parent club Mansfield, went straight into the starting line up alongside midfielder Aaron Tshibola, who joined on loan from Reading. Centre back Scott Harrison also extended his loan stay from Sunderland and featured for the first time since late November. Lining up initially 4-5-1, the Monkey Hangers proved stubborn resistance to Wycombe, who huffed and puffed without causing goalkeeper Scott Flinders any headaches. The breakthrough came on thirty eight minutes after Peter Murphy overturned possession on the edge of his own box and the ball was moved quickly forwards, a hallmark of the Wycombe team this season. Aaron Holloway, enjoying an impressive game, fed Josh Scowen who intelligently spread the ball wide to Fred Onyedinma and the eighteen year old burst into the box before hammering the ball past Flinders at his near post. Switching Onyedinma to the right of the front three shortly before his goal made the difference and the youngster turned in an excellent performance. The Chairboys played some wonderful stuff after the break but failed to add to the scoring which was the only blot on the copybook. Both Sam Wood and Peter Murphy fluffed clear chances and, had the latter taken his, it would have capped off a tremendous move. Bingham nearly made Wycombe pay for their bluntness in front of goal when his header clipped the outside of the post five minutes from the end. There was still time for Darren ‘card machine’ Deadman to dismiss Lewis Hawkins for two yellows but Wycombe saw out a deserved win. Here are the commentary highlights from myself, Paul Dixon and Scotty. Many thanks to Keith Cummings for the audio. On Friday I was on the escalators in H&M Oxford Street when I realised I was completely surrounded by images of former Chairboy John Halls. 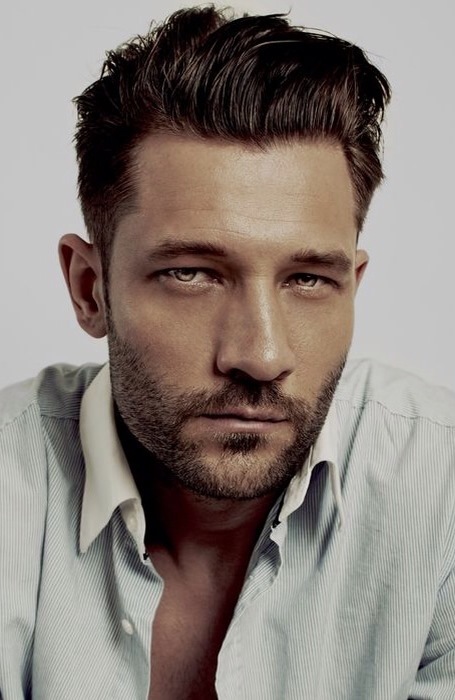 “Bloody hell, it’s John Halls” i exclaimed. My girlfriend replied “I have no idea who that is but he’s fit”. I spent the next five minutes explaining in detail just how badly he had played for Wycombe Wanderers in a home defeat against Stevenage, before he admitted defeat against a troublesome achilles injury and hung up his boots a few years ago. (With chat like this, it’s a wonder I have a girlfriend at all). It’s great to see that John has carved out a successful career as a model after football though. Anyway, this episode made me cast my mind back to when Wycombe Wanderers signed him and Ben Harding. These signings epitomised a hugely underwhelming transfer window following promotion to League One and saw the start of a painful decline that nearly led to The Chairboys sliding out of the Football League. Back then the money supply had been cut and there was no long term plan or indeed any strategy for the club. Gary Waddock struggled in his recruitment as a result. These days the green shoots of recovery are there for all to see. Along with the remaining faces of the golden final generation of the youth academy, Gareth Ainsworth has signed well and given Wycombe Wanderers a blue print for recovery. Paris Cowan-Hall was a precocious talent shown the door by fellow League Two club Plymouth Argyle before Ainsworth brought him into the fold at Adams Park for free. Paris has undergone a transformation under the guidance of the management team and this season you can see that the penny had dropped with him adding graft and grit to his game. 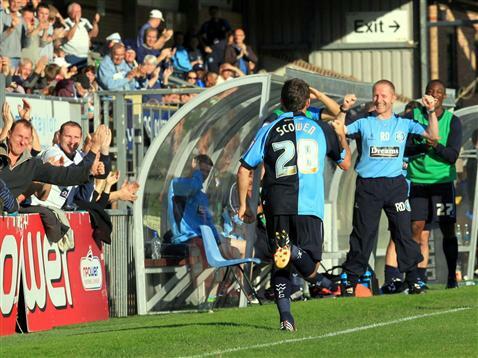 The rewards have followed with the Wycombe fans seeing a goal rush before Cowan-Hall’s departure. More importantly, the club has made some money from the deal (believed to be £85k) and put themselves on the map as a place where young talent can be nurtured in the furnace of competitive league football. Aaron Pierre is the next one on the production line and I will be amazed if he is still here at the end of his three year contract. Add in Matt Ingram, Josh Scowen, Peter Murphy etc and a financial recovery plan of sorts is there for all to see. What is also encouraging is that the club appear to be in a stronger negotiating position when it comes to selling on players and hopefully harsh lessons have been learned from the past few seasons. Crucially, the home attendances are starting to creep up too, with three and a half thousand Wycombe fans at Adams Park for the Hartlepool United game. Of course flogging off the best players is not going to help bring the crowds back, only wins and good football can do that which will require a decent squad. At the start of the season new chairman Andrew Howard said it was a two year plan. We are a quarter of the way through now and Ainsworth has got Wycombe punching well above their financial position. January will be an interesting month. 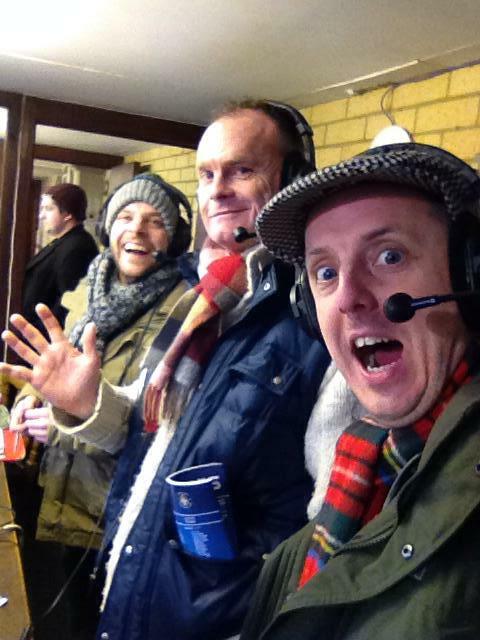 A BBC Three Counties derby and a very enjoyable match to commentate on. In pretty dreadful conditions, both teams gave their all and at the final whistle I think a point a piece was about right. It would have been cruel for either team to lose the game, especially as both sides were definitely still in the market for the win during the final stages. Paris Cowan-Hall was deservedly awarded man of the match for an excellent all round performance. His work rate has been excellent all season and he is now being rewarded with a purple patch in front of goal. Five goals in as many games is no mean feat and the Chairboys have now broken their league record by scoring in sixteen consecutive games. Cowan-Hall’s opening goal was backed up by a performance of real maturity, grafting in defence and a constant menace in attack. 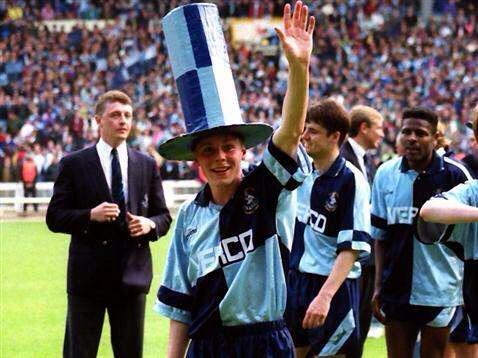 He was a real rough diamond when he first arrived at Adams Park. Credit must be afforded to Gareth Ainsworth for signing Paris on a free, putting his arm around him and making the wide-man fulfil his potential. Luton lived up to what I expected from a John Still side and I think they will be challenging at the top in May. I thought The Hatters looked short of a striker but with Paul Benson out injured I reckon Still will get the cheque book out in January. I was looking forward to seeing the gravitationally gifted Steve McNulty play and I was not disappointed by his performance. He may well be on the wrong end of a few chants from the crowds up and down the country but I thought he read the game superbly and was a stubbornly effective rearguard for Luton. Jonathan Smith took his goal very well and it was a good team response from going behind to an early goal which was another defeat for zonal marking. Matt Bloomfield looked lively in the second half, coming on for an injured Danny Rowe as both sides pursued the points. A tremendous Matt Ingram save from Adam Drury and Mark Tyler making a smart stop at the other end soon after kept things level which is how it ended. This was despite a real cup tie style finish as the rain ramped up towards the whistle. A valuable point earned for both sides and more importantly for Wycombe Wanderers, a performance to be proud of in front of a bumper crowd. All too often in recent times, the Chairboys have choked when the gates have been big at home, but any lapsed or potential new fans in attendance on Boxing Day would have gone home thoroughly entertained. Before kick off, Wycombe chairman Andrew Howard spoke of the long term plans and these will certainly need to involve more people turning up at Adams Park on a regular basis. it was also announced that Gareth Ainsworth had signed a ‘long term’ deal with the club which was warmly received by the home fans in the Vere Suite. The manager is clearly enjoying working with Howard and the results reflect this. Long may it continue! Wycombe remain unbeaten on the road in the league following a deserved point on the South coast. Infact, it could have been three points after another impressive display, in which the Chairboys took the lead but were unable to hold out in the cauldron like atmosphere of Fratton Park. Pompey keeper Paul Jones was the busier keeper in the first half as Wycombe’s 4-3-3 formation applied steady pressure on the 3-5-2 of the home side. Portsmouth looked dangerous on the break, exploiting the space out wide but Joe Jacobson and Sido Jombati stood firm. These two full backs are fantastic acquisitions for Gareth Ainsworth that allow him to commit players further forward and in the instance of Saturday, match three strikers against the back three of Portsmouth. Youngster Jack Whatmough had such a torrid time against Paul Hayes he was replaced by an out of position Johnny Ertl at half time. Pompey were still finding their feet after the break with a new back three when Wycombe were able to pounce on fifty minutes. A clever finish by Sam Wood following a mis hit shot by Peter Murphy gave the Chairboys a deserved lead and silenced the massive home support. Five minutes later it should have been game over. After some excellent work from Sido Jombati, Matt McClure found himself through on goal and with just Jones to beat he lashed his shot over the bar. Before Wycombe could even rue that miss, the impressive James Dunne rattled Matt Ingram’s crossbar at the other end. Andy Awford moved to a 3-4-3 and backed by a vociferous home crowd Pompey began to turn the screw with Jed Wallace the main threat. It was a corner that brought about the equaliser with substitute Ertl unmarked and able to volley home on seventy minutes. This was made even more disappointing by Wycombe’s lack of threat from their own set pieces, which up to Saturday had been a real positive from the campaign so far. Paul Hayes picked up a birthday yellow card for possibly the longest substitution I’ve ever seen as the captain had to waste time whilst Paris Cowan-Hall had to completely change his kit as a result of a blood injury. Understandably, the home supporters were getting increasingly frustrated with Wycombe’s time wasting and a combination of this plus five substitutions and a couple of injuries led to six minutes of injury time. The Chairboys saw this out comfortably but even some of the away contingent were not happy by some of the gamesmanship on display. No one likes to see time wasting, least of all paying punters but slowing the game down and frustrating the opposition is something that Gareth Ainsworth has clearly drilled into his tightly knit squad. The Wycombe manager survived a torrid season last time out and is now, with a limited budget, admirably using every single thing in his control to turn the club around. Currently on an impressive unbeaten run of six games I can’t see these tactics changing until either his magic points target is reached or the referees take control. Wycombe only picked up one yellow card for time wasting on Saturday and that came in the eighty-eighth minute. With officials as lax as this it is easy to see why managers employ the tactic. I often say on the match commentary that Gareth Ainsworth is kicking every ball on the touchline. 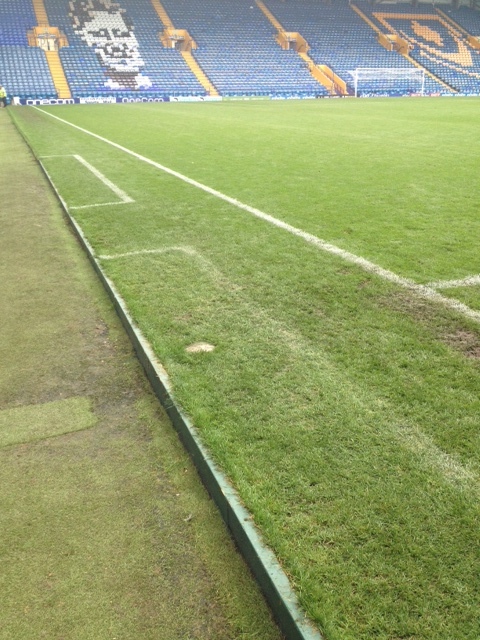 I’ll leave you with this photo which is an interesting comparison of technical areas after Saturday’s game at Fratton Park.